Groupama sailing team’s position was cloaked on Thursday as they led the Volvo Ocean Race fleet into the Leg 2 anti-piracy stealth zone. The French team, skippered by Franck Cammas, were the first to pass into the stealth zone, implemented by race organisers to mask the exact location of the yachts as they head towards an unnamed ‘safe haven’ in the Indian Ocean. 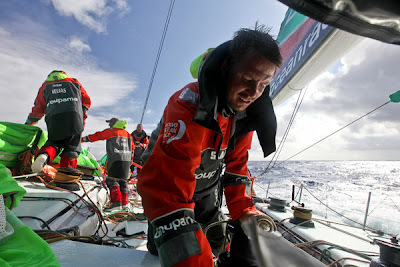 Groupama 4 entered the area, where fans will still be able to see the relative positions of the boats via the Distance to Leader feature, shortly after 1000 UTC, around 80 nautical miles ahead of their closest rivals PUMA Ocean Racing powered by BERG. At the 1300 UTC position report, PUMA had a lead of around 15nm over third placed Team Telefónica, with CAMPER with Emirates Team New Zealand trailing Telefónica by around 38nm. 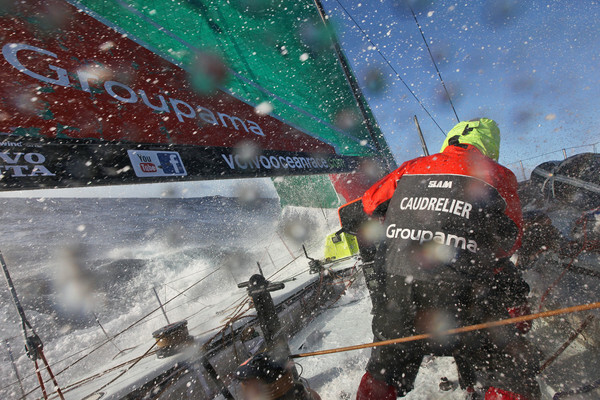 The big challenge to Groupama's lead could come from the Doldrums, the band of dynamic, variable low pressure characterised by light winds but notorious for sudden squalls, and well capable of reshuffling the leaderboard entirely. “We’re going into an area where the wind is very hard to anticipate so we have to be very pragmatic and take all opportunities to get through the Doldrums,” said Cammas, who was preparing to celebrate his 39th birthday on board with a chocolate cake. Before they even get to the Doldrums, though, there is a moving low front to the east of the fleet, with more opportunities for a shake-up in the order. Once they reach the secret safe haven, the fleet will be shipped to a location off the Sharjah coastline, a measure introduced to minimise the risk of piracy. They will resume the race at that point with a sprint into Abu Dhabi. Team Sanya continue to work on a plan to see them back in the leg after they were forced to suspend racing and head for Madagascar with rigging problems. They had a 200nm lead on the fleet at the time. “I think it’s really settled in for all of us now, and it hurts,” skipper Mike Sanderson said.